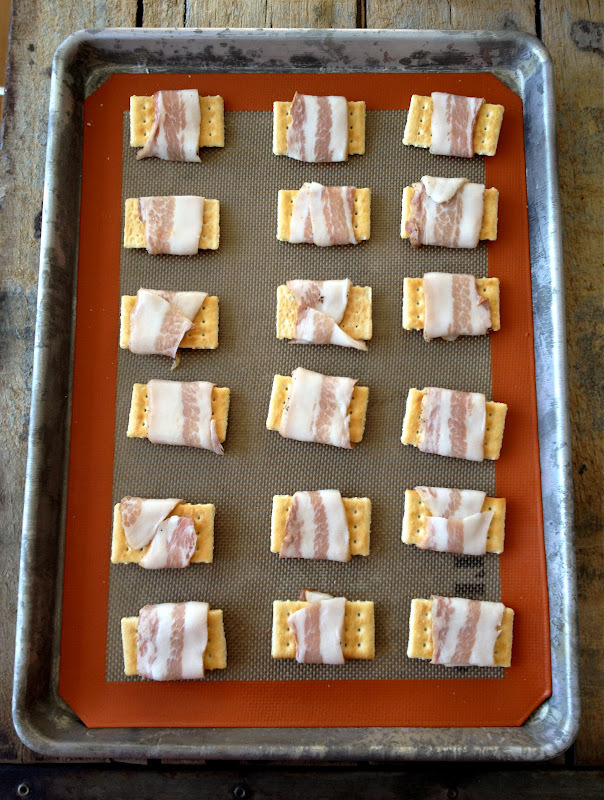 Lushly Low-Brow: Bacon-Wrapped Club Crackers! / Hey, EEP! Lushly Low-Brow: Bacon-Wrapped Club Crackers! The words "stupidly delicious" may come to mind, and you're right! These have no right to be as delicious as they are, but, why knock something that works so damn well, right!? I've been making these in secret for years. Now that it's out in the open—I finally served some to my gentleman and friends—I feel comfortable enough to share 'em with you too. Hope you enjoy! Wrap strips of center-cut bacon around Club Crackers, 1 strip per cracker. Arrange on a lined baking sheet and bake in a 250˚ oven until the bacon is crisp, about 2 hours (or 350˚ for 15 to 20 minutes if you can't wait that long!). Let cool slightly before serving. Ree Drummond, the brilliant Pioneer Woman, makes a version topped with cheese (!!!!) Give her recipe a try, as well. Here's a link! I'm going to try these with a little pepper and brown sugar added near the end of the baking time- yum yum yum!